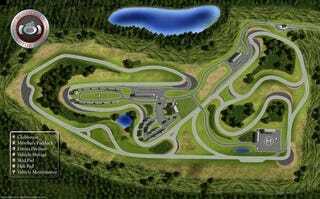 The US Grand Prix could be run within spitting distance of New York City according to the president of Monticello Motor Club, who says Formula One is considering his new track in the Catskills. Formula One's expressed interest in adding a US track to the global series after a long absence, but recent attempts to secure one have faltered. Monticello Motor Club president Ari Strauss thinks his track in upstate New York might have what it takes. In a letter widely and predictably leaked by club members, Strauss says Formula One's chief engineer spent time taking measurements of the 4.1-mile circuit after a successful meeting between the club and F1 maestro Bernie Ecclestone. The track was pronounced suitable, should a few "minor" modifications be made. Monticello now joins the running for a 10-year exclusive contract for the race, a contest Strauss describes as "like winning the Olympics." Located about 90 minutes' drive north of the city, Monticello is a private track for wealthy car enthusiasts. It's a huge, varied track with 20 corners and three straights totalaling 1.5 miles on their own. If a Cadillac CTS-V can reach 170 MPH on the back straight, imagine the speeds F1 cars would reach. The only problem is a complete and utter lack of spectating areas (really, there's none), something likely to be addressed if the track is awarded the contract. Within the next day, you may read that Formula 1 (F1) is planning a return to the United States and has their sights on a special location in New York: Monticello Motor Club. A few months ago, Bill McMichael and I met with Bernie Ecclestone, President/CEO of Formula One Management (FOM), and discussed the terms for an exclusive 10-year United States Grand Prix to be hosted at MMC. Shortly thereafter, Hermann Tilke, the chief engineer and circuit designer for F1, spent time at MMC and confirmed that our track and surrounding properties, with some expansion and minor track modifications, is an excellent location for a Grand Prix. Since receiving a letter of understanding from FOM confirming their hope to bring the US Grand Prix to Monticello, Bill and I have continued to secure the backing and support of local, state, and federal politicians and organizations.